POMPEY football thugs who terrorised Portsmouth city centre ahead of a Plymouth game were shown no mercy by a judge who threw eight hooligans behind bars for a total of nearly 10 years. 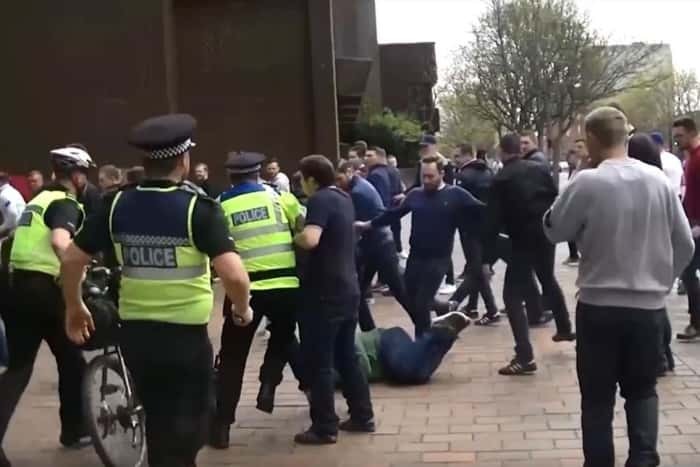 The gang of 16 defendants, who appeared at Portsmouth Crown Court throughout the week, were clinging to the hope they may be spared jail for their violent disorder before the League Two clash in April last year. Stills from body-worn police cameras during violence before the Pompey-Plymouth game in 2017. ‘Eight men have now been jailed. But those hopes were crushed for half of them as one by one they were sent down. Despite lengthy running battles against police in Guildhall Square and clashes with Plymouth fans, including where one was repeatedly booted like a football, things could have been far worse. Robbie Fowler, 22, of April Square, Landport, was handed the longest jail term out of the hooligans after he was given two years behind bars and a six year football banning order. Judge Mousley told Fowler, who was serving a four year banning order at the time, he was the ‘most prominent among the group’ with him seen ‘limbering up’ to fight. Chief among his offences in amongst the constant violent disorder were him kicking out at a police dog and trying to get a policeman to fight him. Matthew Allinson, 33, of Frogmore Lane, Waterlooville was given 18 months jail and a six year football banning order. Richard Hampshire, 26, of Tudor Crescent, was given 14 months custody and a six year football banning order. Ryan Keating, 19, of Oxenwood Green, Havant, was given 13 months in a young offenders institute and a six year football banning order. Anthony Hopkins, 22, of Langley Road, Buckland, was given 12 months prison and a six year football banning order. Tommy Russell, 20, of Appleshaw Green, Havant, received 12 months at a young offenders institute and a six year banning order. Harley Hawkins, 19, of Whitecliffe Avenue, Copnor, was handed the same sentence. Sean Mitchell, 46, of Chaucer Drive, Chichester, was handed 14 months prison and a six year football banning order. Simon Hore, 33, of Medina Road, Cosham, was given 13 months prison suspended for 18 months, 250 hours unpaid work, compensation of £250 to Pompey and a four year football banning order. Louis Glasspool received the same sentence but was given 10 months at a young offenders institute suspended for 18 months. Harry Jarvie, 21, of Manor Road, Buckland also received the same but was given 12 months jail suspended for 18 months. Connor Bowen, 19, of Lower Farlington Road, Farlington, was handed eight months in a detention centre suspended for 18 months, was given 250 hours unpaid work, 20 rehabilitation days, told to pay Pompey £250 and given a four year football banning order. Tommy Houlden, 19, of Hayling Avenue, Copnor, was given the same as Bowen but was given 15 months at a detention centre suspended for 18 months and 15 rehabilitation days. Asa Palmer, 23, of Sea View Road, Drayton, got nine months jail suspended for 18 months, 250 hours unpaid work, 20 rehabilitation days, told to pay compensation of £250 and a four year football banning order. Jack Stobart, 23, of April Square, Landport, was given 12 months jail suspended for 18 months, 250 hours unpaid work, a four year football banning order and told to pay Pompey £250. Shane Bartram, 26, of Goodwood Road, Southsea, got 12 months prison suspended for 18 months, as well as 250 hours unpaid work, told to pay £250 compensation and a four year banning order.